f/5.6, ISO100, 1/2sec, Active D-Lighting, Fluorescent WB, Matrix metering. Diorama as usual - and actually an extensive one representing some kind of back alley. I'll probably write an article about this one and publish it here later if i could get it done fast. EXkurogane (4 anno/i fa) #2513171Lol nope, the opposite of an artist in fact. I'm in the medical field as my career, nothing to do with art. Figure collecting and photography are just hobbies. 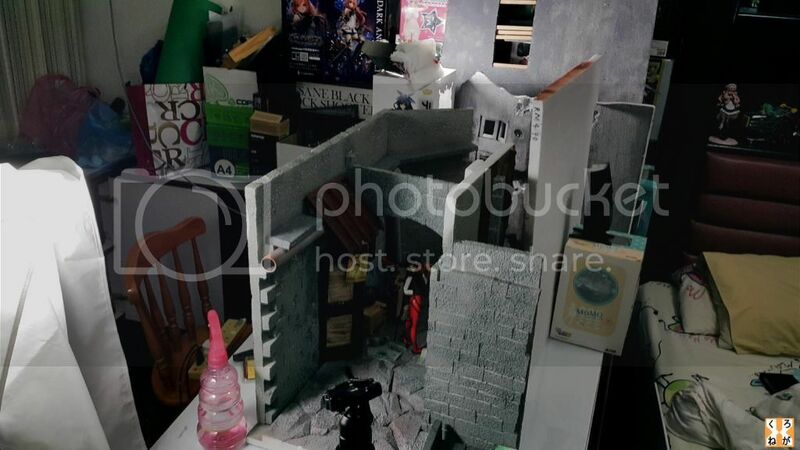 I just read that some folks spends quite some $$ just to create a good diorama. To me, this is not just a hobby but a passion! I guess you are on the way there, if not already there. tanaka (4 anno/i fa) #2505918Impressive! Are you an artist? Lol nope, the opposite of an artist in fact. I'm in the medical field as my career, nothing to do with art. Figure collecting and photography are just hobbies. Impressive! Are you an artist? Arie (4 anno/i fa) #2436026I was wondering, since you have done a lot of dioramas, do you keep them after you're done with the shoot? Do you store them somewhere or do you take them down and reuse some parts? In any case, I absolutely love your pictures! They are gorgeous! Yup, i do store most of them - and since i dont really like reusing the same design or background for 2 different figure shoots, i will modify and reuse some of the existing parts into a different design. I was wondering, since you have done a lot of dioramas, do you keep them after you're done with the shoot? Do you store them somewhere or do you take them down and reuse some parts? In any case, I absolutely love your pictures! They are gorgeous! wow! you did a good job with that diorama. Damn, I admire all the work you and the other dedicated photographers put into making such wonderful photographs.